Peruvian food with a focus on fresh ceviche and rotisserie chicken in Carlsbad. : Chef Emmanuel Piqueras (Arzak, San Sebastian; Andina, Portland; Mixtura, Seattle; Panca, New York City), who is also the host of Sabor y Fusion, a popular Latin American cooking show, has partnered with local Sami Ladeki (Sammy's Wood Fired Pizza) to bring Peruvian cuisine to San Diego. 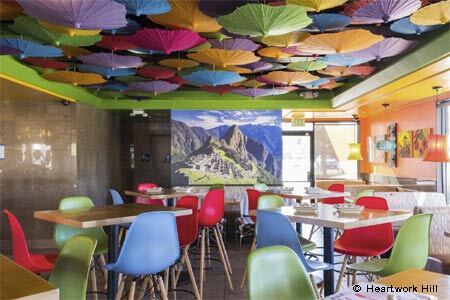 The colorful eatery, whose ceiling is a kaleidoscope of brightly hued parasols, is known for its variety of made-fresh ceviches and tender spit-fired chicken, as chef Piqueras believes that these dishes "represent the soul of Peruvian cooking." A compelling array of pisco-inspired cocktails (made with Peruvian white brandy) complements the cuisine. Try a pisco sour with passion fruit purée and a cap of egg white froth, then dig into the bay scallop and shrimp ceviche with avocado-jalapeño emulsion and crisp toasted corn and yams. The menu also features grilled octopus, beef empanadas, traditional lomo saltado (beef tenderloin), braised lamb shoulder, salads, burgers and more. A sister outpost is located at Liberty Station in Point Loma, 2401 Truxtun Rd., Ste. 102, San Diego, 619-222-3111.